Today marks the five year anniversary of the bicycle accident that changed my life. Other than planning to get back on a bike for the first time in five years, I hadn’t really thought much about the anniversary. While kneeling with my husband, thanking God for my bountiful blessings – family, home, sunshine – I asked for protection while I take my bike out for the first time in five years. I didn’t expect to cry, and it caught me a little by surprise. Today was going to be the day I faced my fears and prayed for balance long enough to ride a block on the bike which I used to ride for miles. That’s all. But God wanted me to remember. And acknowledge. Not just the pain, but the growth. And He took a week to prepare me for the lesson. A week ago today, I awoke in terrible pain with a muscle spasm from the base of my skull to my hip – my left hip – the side that hit the pavement after my head hit the bottom rail of a fence. I hadn’t experienced this type of muscle spasm for many many months. And I hadn’t done anything different that would explain the pain on the same side I landed when I wrecked my bike five years ago. But my body remembered, even if I didn’t. This past week, my husband pulled out all of our home videos from years ago and I watched a beautiful, vibrant, energetic, polished younger self tackle the demands of work, school, husband, and children in blizzard-like fashion – talking and moving faster than I remember possible. And for a brief moment, I determined to regain that same energy. Oh, but for a bicycle accident five years ago, I’d still be pouring out more of myself than God could pour in. God, the great Creator, had different plans, though. 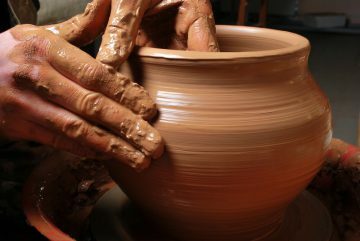 He took that still-wet clay pitcher, and he pounded it down on the potter’s wheel. And he fashioned a bowl. I sat silent for many weeks and months, listening with my heart because my head wouldn’t work. And God filled my bowl, drop by drop, to overflowing – with His love. And lest I think God is done with shaping me, I am reminded that the clay is still wet. There will be future events – trials, tragedies, and beautiful blessings beyond imagination – that will shape who I am as life rolls forth towards the day that I will step out of this clay body prepared to meet my Creator. No, not an accident. Just part of the plan. 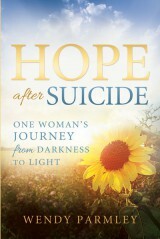 This entry was posted in Uncategorized and tagged brain injury, creator, God, hope after suicide, Love, mental health, Savior, TBI on September 26, 2016 by Wendy Parmley.